Tropical Storm Irma broke pecan tree limbs, knocked trees down and blew nuts off the trees and out of their shucks when it moved through Georgia in early September, yet University of Georgia Cooperative Extension pecan specialist Lenny Wells is still optimistic about this year’s crop. He estimates yields ranging from 85 to 100 million pounds. The pecan harvest season is well underway and Georgia farmers are taking advantage of dry weather and good prices, Wells said. As a result, the pecan market softened in recent weeks, lowering some prices. Wells doesn’t expect the price to stay low for long. “We often see this trend when the nuts really start rolling in every year. The last several years, the price bumped back up again after a couple of weeks as many growers started holding pecans. I wouldn’t be surprised to see this happen again,” Wells said. The crop’s development was ahead of schedule by about 10 days this year. All varieties are currently being harvested, and due to the early timing of nut maturity, Wells expects most of this year’s harvest to be completed by early December. Before pecans fully mature, they are enclosed in a green shuck, or husk. When Tropical Storm Irma moved through the state on Sept. 11, a lot of those immature pecans were knocked to the ground, rendering them useless. Early on in the harvest season, as many as one-third of the nuts brought into some cleaning plants were rejected, Wells said. Many of these were nuts that blew off the trees as green shucks. “When we were able to survey the damage after Irma, we estimated that as much as 30 percent of this year’s crop was lost. But now as pecan loads are brought in, we are seeing just how much of the crop suffered damage, with the green shucks that were blown out and quality losses from the nuts getting battered around in the trees by the wind,” Wells said. Georgia farmers are reporting that 3 to 5 percent of the nuts in harvested loads have cupping, or the tail end of the nut failing to fill out. Cupping is identified by a hollow spot on the bottom of the kernel. Wells attributes cupping to nuts coming out of the shuck, being blown off with the shucks open during the storm, or suffering shuck damage by high winds. 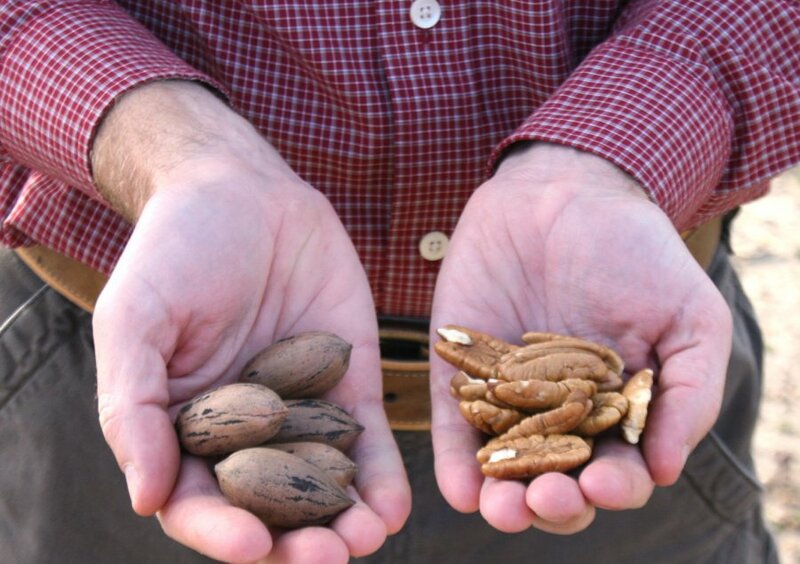 For up-to-date information about Georgia’s pecan crop, see Wells’ blog at http://blog.extension.uga.edu/pecan/author/lwells/.